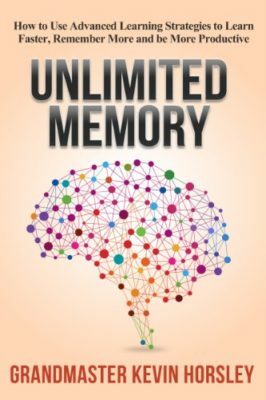 SYNOPSIS: A short and accessible introduction to mnemonic memory techniques for anyone looking to quickly improve their memory and increase their productivity – by Grand Master of Memory, Kevin Horsley. NOTE: Sometimes a book is worth reading because it states something new. Sometimes it’s worth reading because it restates or updates old ideas in novel and interesting ways. Unlimited Memory achieves neither convincingly. Don’t get me wrong, if Unlimited Memory is sitting on your shelf and you’ve never read anything on the topic – read it. It’s short, practical, well-written, covers the basics of mnemonic memory techniques and colours them with good, interesting examples. But if you haven’t got a copy yet – don’t bother. Instead, read this crunch of Lorayne and Lucas’s Memory Book – which, despite being published 40 years earlier, explains everything you’ll find in Horsley’s effort just as clearly, still more comprehensively and in roughly the same number of pages.